By John C. Toman. Posted May 11, 2013, 1:12 PM. Just a few days after a late-season storm, high pressure is revving up over Southern California, and it should make this weekend a clear and hot one in the inland valleys. The middle part of Western Riverside County could see 100 degree heat, which would be the first of the year. 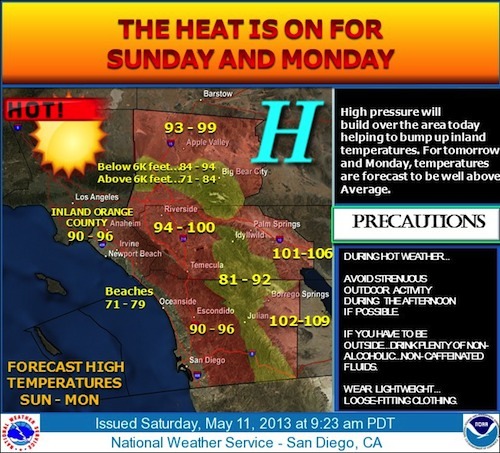 Lake Elsinore, Wildomar and Menifee are currently predicted to top triple digits Sunday and Monday. To the north, the Riverside and San Bernardino metros will also bake, with temperatures in the upper 90's. The south is expected to be slightly cooler. The National Weather Service is recommending limiting outdoor strenuous activity during the afternoon, if possible. Elsewhere in the region, marine layer and onshore flow will continue to play a role, especially at the coast, but even inland in places such as Fallbrook. Areas near the coast will be warm, however. Mountain and pass areas will be near 90 degrees. A cooling trend beginning Tuesday will bring temperatures back down to normal by the latter half of next week. Hot May weather is not unusual. 2012 was an example, in fact, with five hundred degree days recorded in Lake Elsinore, the first on May 9th. Wildomar had three triple-digit days last year in May; Menifee two; and Hemet one.